One thing everyone seems to agree on: California’s transportation system needs fixing. On exactly what to fix and how to get money to do so, however, it is not so easy to find common ground. The latest proposal from the state legislature is hanging in the balance, and there may or may not be a vote on it before the special session ends on November 30. But locals aren’t waiting around for the state to act. At least twelve counties have placed transportation sales tax measures on local ballots to help fund infrastructure, transit, and other transportation needs. Streetsblog has already endorsed Los Angeles County’s Measure M. Below, Minerva Perez looks at two other local transportation sales tax measures in the Central Valley. Streetsblog will cover other counties in the coming week or so. Stanislaus and Merced counties are both proposing half-cent sales tax measures to generate revenue to repair and refurbish local roads, improve on or build bicycle and pedestrian infrastructure, and improve local and county transit services. The taxes will also help fund several regional transportation projects. In addition, they will provide matching funds that will make it easier for the counties to compete for federal funds for additional projects. If voters approve it, Measure V, Merced County’s initiative, would generate $450 million in revenue over the next thirty years. 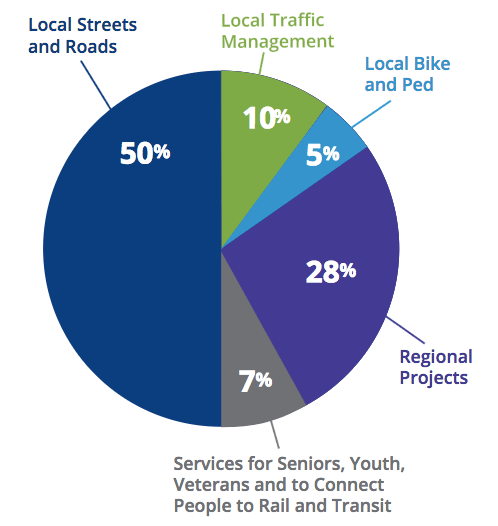 The expenditure plan calls for allocating half of the funding to local jurisdictions to spend on transportation needs as they see fit. The plan intentionally does not include specific projects, instead leaving those decisions for the most part in local hands. Dabbs noted that this means they can build new roads if they want to, or they can use the funds to repair potholes, repave streets, and replace traffic signals. “We do have a huge backlog of maintenance needs,” she said. 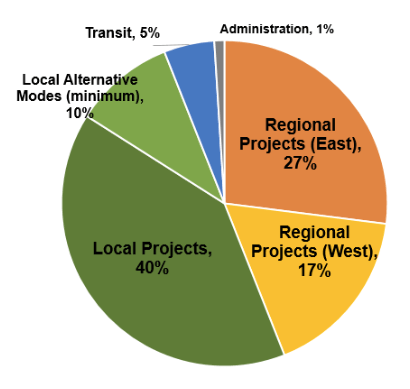 About five percent of the remainder is for transit projects, and the rest will go for regional transportation projects, which can include highway “improvements,” passenger rail, or ride-share and vanpool programs. “People that don’t have a car or use transit as their mode of transportation are still required to pay the sales tax, and we wanted to make sure that they see improvements across the board–not just on our streets and roads,” she said. Dabbs said a formula was created to allocate funds equitably between jurisdictions and the county. It takes into account local population and number of road miles, and starts with a base amount of $150,000. For example, assuming revenues reach $15 million per year, Merced, the most populous city in the county, would receive $1.6 million for local road improvements, and city staff must spend at least $300,000 of it on projects for walking and bicycling. Josh Pedrozo, a Merced city council member, said there are many ways the city could spend the local funding on active transportation. Merced has a good basic network of bicycle lanes and trails that could be improved upon. There are also areas of the city where students must walk along dirt roads to get to school, and one part of town where hotels are located that has no sidewalks, he said. “It definitely affects the south side of the city, where a lot of people rely on their feet to get them around,” he said. Transit would get about five percent of the sales tax revenue. The county’s sole transit provider, The Bus, is expected to receive about $22.5 million to enhance programs and services, which could include new routes or expanded services on existing ones. The money could also be used to purchase low-emission buses or install bus shelters, or to subsidize or reduce fares. The remaining 44 percent ($198 million) of the revenues expected from Measure V would be divided between the east side of the county (27 percent) and the west side (17 percent), to be used for projects already in MCAG’s Regional Transportation Plan. Some of that will likely go to adding highway capacity. One particular project that county officials want to finish is the Campus Parkway, an expressway connecting highways 99, 140, and 59 to the University of California campus. Dabbs said that the revenues from the measure will help the county compete for federal dollars to finish the project. MCAG believes the project will help with congestion and improve the economy by connecting major highways. Neighboring Stanislaus County also has a half-cent sales tax measure on the ballot, Measure L, which would raise about $960 million over the next 25 years if voters approve it. Measure L has a more highly detailed expenditure plan than Merced County’s plan. It maps out specific projects, including which specific streets will be resurfaced. “People want to know what we are going to do,” said Kendall Flint of Regional Government Services, a consultant that helped develop the expenditure plan and conduct outreach. According to the expenditure plan, 65 percent of the funds will be under local control, with half ($480 million) to be used for repair and maintenance of roads, ten percent for traffic management ($96 million), and five percent for bike and pedestrian projects ($48 million). None of the local funding will be used for the construction of new roads. “This was in line with what residents were saying, to fix what we have,’” Rosa De Leon Park, executive director of the Stanislaus County Council of Governments (StanCOG), said at an outreach event at Modesto Senior Center. However, there are fifteen regional projects identified in the plan that include new lanes, a new expressway, and new interchanges. Those projects are slated to receive 28 percent of the total revenue. Transit projects will receive seven percent ($67 million) of expected revenues, with $13 million being allocated to the four transit operators in Stanislaus County based on fare-box collection for operation and maintenance. In addition, transit services that target seniors, veterans, and persons with disabilities will receive $20 million, and $13 million will go to improve public transit connections to passenger rail services like Amtrak, ACE in San Joaquin County, and BART in the Bay Area. Another $20 million will go toward increasing and upgrading transit services in pocket communities in the county. Flint said the committee that drafted the plan chose to allocate the funding based on the amount each jurisdiction earns in sales tax revenue, so that each city keeps whatever it brings in. That means cities with more active retail stand to benefit; but it also means a floor had to be set so that smaller communities where there isn’t a lot of tax generation would not be left out. From that agreement, cities like Hughson and Waterford would get approximately $24,000 annually for bicycle and pedestrian improvements; larger cities like Modesto and Turlock are expected to raise $687,000 and $293,000 each year, respectively. Stanislaus county is expected to generate $13 million in revenue for bicycle and pedestrian projects. Chuck Shoup, a member of the StanCOG Bicycle/Pedestrian Advisory Committee, said that when input was being gathered by county staff on projects, he had emphasized the need for county connectivity, especially between Riverbank and Modesto. Shoup said he is in favor of Measure L, and said that even though a lot of the components may not be specific to cyclists, it can still benefit them by fixing paving problems. “Improving the roads helps. A lot of cyclists have to ride those roads, because often times there is no shoulder. Filling in the cracks making the roads smoother,” he said.